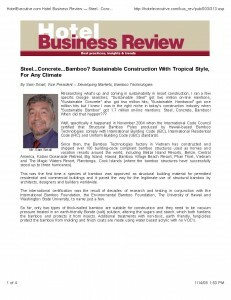 Researching what's up and coming in sustainability in resort construction, I ran a few specific Google searches; "Sustainable Steel" got two million on-line mentions, "Sustainable Concrete" also got two million hits, "Sustainable Hardwood" got one million hits but I knew I was in the right niche in today's construction industry when "Sustainable Bamboo" got 1.7 million on-line mentions. 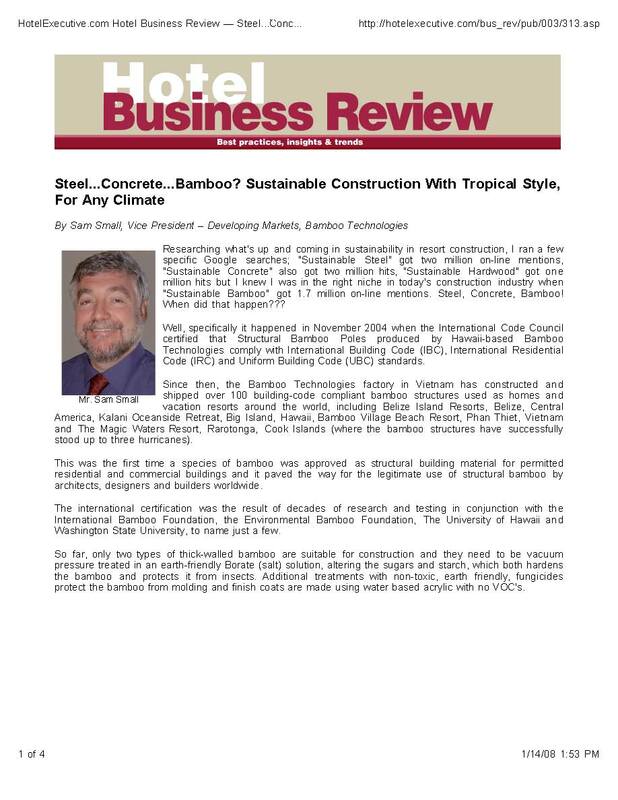 Steel, Concrete, Bamboo! When did that happen??? Well, specifically it happened in November 2004 when the International Code Council certified that Structural Bamboo Poles produced by Hawaii-based Bamboo Technologies comply with International Building Code (IBC), International Residential Code (IRC) and Uniform Building Code (UBC) standards. 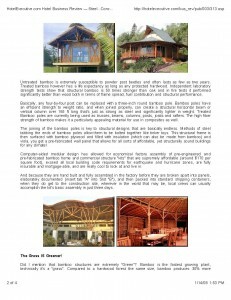 Since then, the Bamboo Technologies factory in Vietnam has constructed and shipped over 100 building-code compliant bamboo structures used as homes and vacation resorts around the world, including Belize Island Resorts, Belize, Central America, Kalani Oceanside Retreat, Big Island, Hawaii, Bamboo Village Beach Resort, Phan Thiet, Vietnam and The Magic Waters Resort, Rarotonga, Cook Islands (where the bamboo structures have successfully stood up to three hurricanes). This was the first time a species of bamboo was approved as structural building material for permitted residential and commercial buildings and it paved the way for the legitimate use of structural bamboo by architects, designers and builders worldwide. The international certification was the result of decades of research and testing in conjunction with the International Bamboo Foundation, the Environmental Bamboo Foundation, The University of Hawaii and Washington State University, to name just a few. So far, only two types of thick-walled bamboo are suitable for construction and they need to be vacuum pressure treated in an earth-friendly Borate (salt) solution, altering the sugars and starch, which both hardens the bamboo and protects it from insects. Additional treatments with non-toxic, earth friendly, fungicides protect the bamboo from molding and finish coats are made using water based acrylic with no VOC's. Untreated bamboo is extremely susceptible to powder post beetles and often lasts as few as two years. Treated bamboo however has a life expectancy as long as any protected hardwood. Independent laboratory strength tests show that structural bamboo is 50 times stronger than oak and in fire tests it performed significantly better than wood both in terms of flame spread, fuel contribution and structural performance. Basically, any four-by-four post can be replaced with a three-inch round bamboo pole. Bamboo poles have an efficient strength to weight ratio, and when joined properly, can create a structural horizontal beam or vertical column over 165 ft long that's just as strong as steel and significantly lighter in weight. Treated Bamboo poles are currently being used as trusses, beams, columns, posts, joists and rafters. The high fiber strength of bamboo makes it a particularly appealing material for use in composites as well. The joining of the bamboo poles is key to structural designs that are basically endless. Methods of steel tabbing the ends of bamboo poles allow them to be bolted together like tinker toys. This structural frame is then surfaced with bamboo plywood and filled with insulation (which can also be made from bamboo) and viola, you get a pre-fabricated wall panel that allows for all sorts of affordable, yet structurally sound buildings for any climate! Computer-aided modular design has allowed for economical factory assembly of pre-engineered and pre-fabricated bamboo home and commercial structure "kits" that are supremely affordable (around $170 per square foot), exceed all local building code requirements for earthquake and hurricane zones, are fully insurable and mortgage-able, and are really cool to look at and live in. And because they are hand built and fully assembled in the factory before they are broken apart into panels, elaborately documented (insert tab "A" into Slot "B"), and then packed into standard shipping containers, when they do get to the construction site, wherever in the world that may be, local crews can usually accomplish the kit's basic assembly in just three days. Did I mention that bamboo structures are extremely "Green"? Bamboo is the fastest growing plant, technically it's a "grass". Compared to a hardwood forest the same size, bamboo produces 30% more oxygen and 20 times the biomass yield. Bamboo can be harvested annually after the first 5 to 7 years without replanting, compared to 25 to 50 years for trees, which then need to be replanted in bare soil. To put it in perspective, it takes 25 years and an acre of land to generate enough 2×4’s to build a typical American house, in just seven years that same acre can generate enough bamboo to build 20 bamboo houses, in 25 years that’s 80 bamboo structures! LAND: Because of its wide spread root system and large canopy, bamboo retains twice as much water in the ground, which prevents soil erosion. WATER: Due to its high nitrogen consumption, Bamboo is an excellent solution for excess nutrients in waste-water from manufacturing, livestock farming and sewage treatment. AIR: Bamboo can sequester up to 12 tons of carbon dioxide per hectare, which makes it an efficient way to replenish fresh air. An environmental, financial and practical assessment of Bamboo as building material for bearing structures was presented at the 7th World Bamboo Congress in 2004. 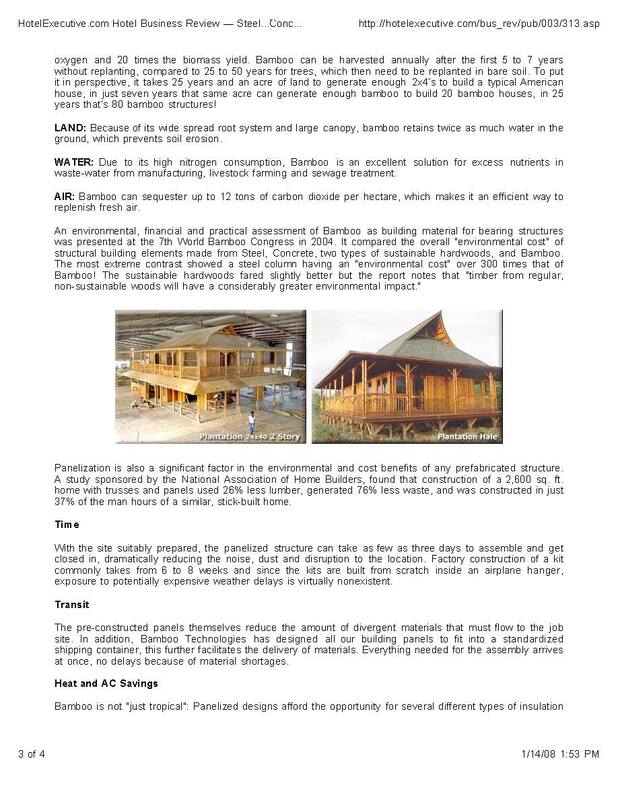 It compared the overall "environmental cost" of structural building elements made from Steel, Concrete, two types of sustainable hardwoods, and Bamboo. The most extreme contrast showed a steel column having an "environmental cost" over 300 times that of Bamboo! The sustainable hardwoods fared slightly better but the report notes that "timber from regular, non-sustainable woods will have a considerably greater environmental impact." Panelization is also a significant factor in the environmental and cost benefits of any prefabricated structure. 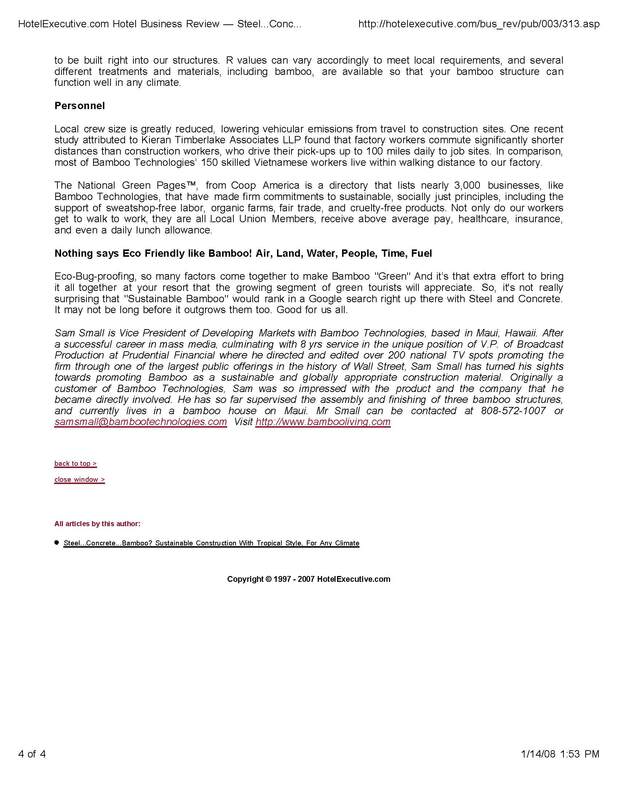 A study sponsored by the National Association of Home Builders, found that construction of a 2,600 sq. ft. home with trusses and panels used 26% less lumber, generated 76% less waste, and was constructed in just 37% of the man hours of a similar, stick-built home. Time With the site suitably prepared, the panelized structure can take as few as three days to assemble and get closed in, dramatically reducing the noise, dust and disruption to the location. Factory construction of a kit commonly takes from 6 to 8 weeks and since the kits are built from scratch inside an airplane hanger, exposure to potentially expensive weather delays is virtually nonexistent. Transit The pre-constructed panels themselves reduce the amount of divergent materials that must flow to the job site. In addition, Bamboo Technologies has designed all our building panels to fit into a standardized shipping container, this further facilitates the delivery of materials. Everything needed for the assembly arrives at once, no delays because of material shortages. Heat and AC Savings Bamboo is not "just tropical": Panelized designs afford the opportunity for several different types of insulation HotelExecutive.com Hotel Business Review — Steel…Conc… http://hotelexecutive.com/bus_rev/pub/003/313.asp 4 of 4 1/14/08 1:53 PM to be built right into our structures. R values can vary accordingly to meet local requirements, and several different treatments and materials, including bamboo, are available so that your bamboo structure can function well in any climate. Personnel Local crew size is greatly reduced, lowering vehicular emissions from travel to construction sites. One recent study attributed to Kieran Timberlake Associates LLP found that factory workers commute significantly shorter distances than construction workers, who drive their pick-ups up to 100 miles daily to job sites. In comparison, most of Bamboo Technologies’ 150 skilled Vietnamese workers live within walking distance to our factory. 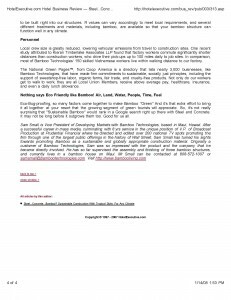 The National Green Pages™, from Coop America is a directory that lists nearly 3,000 businesses, like Bamboo Technologies, that have made firm commitments to sustainable, socially just principles, including the support of sweatshop-free labor, organic farms, fair trade, and cruelty-free products. Not only do our workers get to walk to work, they are all Local Union Members, receive above average pay, healthcare, insurance, and even a daily lunch allowance. Eco-Bug-proofing, so many factors come together to make Bamboo "Green" And it’s that extra effort to bring it all together at your resort that the growing segment of green tourists will appreciate. So, it's not really surprising that "Sustainable Bamboo" would rank in a Google search right up there with Steel and Concrete. It may not be long before it outgrows them too. Good for us all.